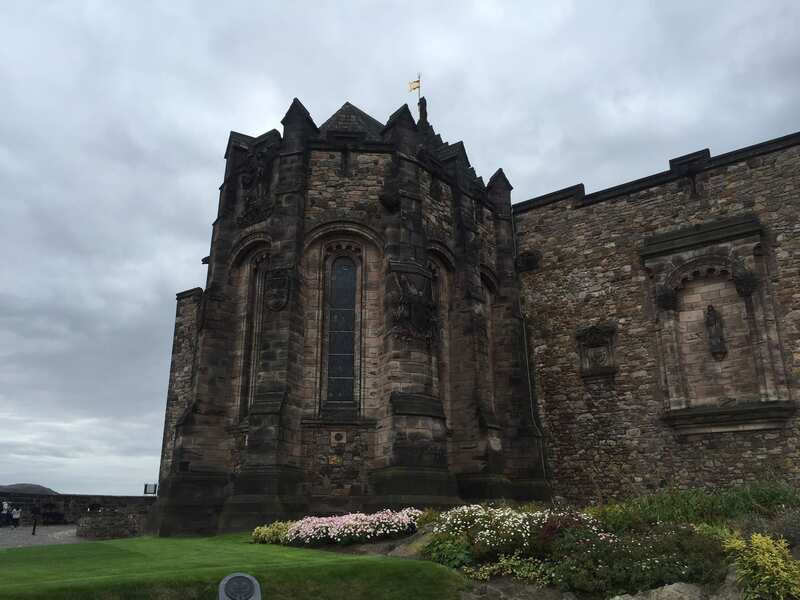 We didn’t have much time in Edinburgh but I knew I must visit tour Edinburgh Castle. 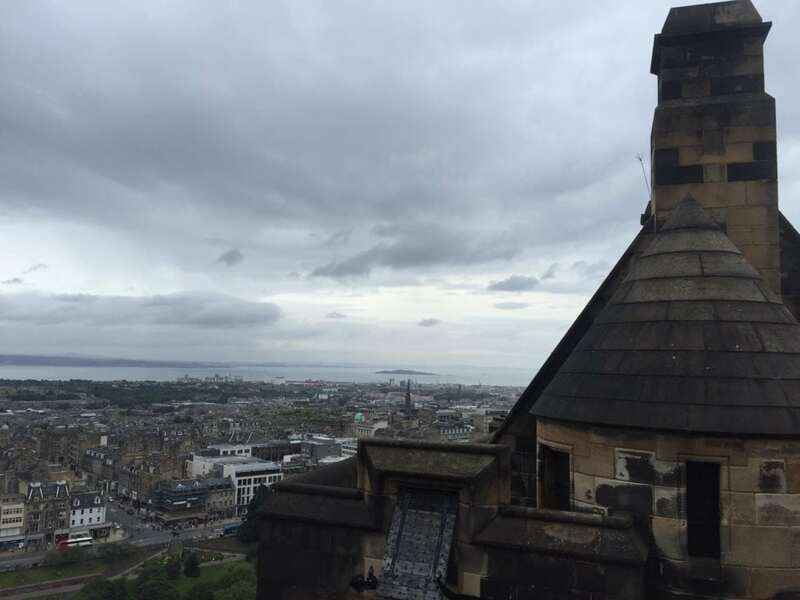 The castle is located at the end of the Royal Mile at the top of a hill overlooking the city. I heard the castle was very significant from a historical perspective, had great views, and was one of the top things to do in Edinburgh. 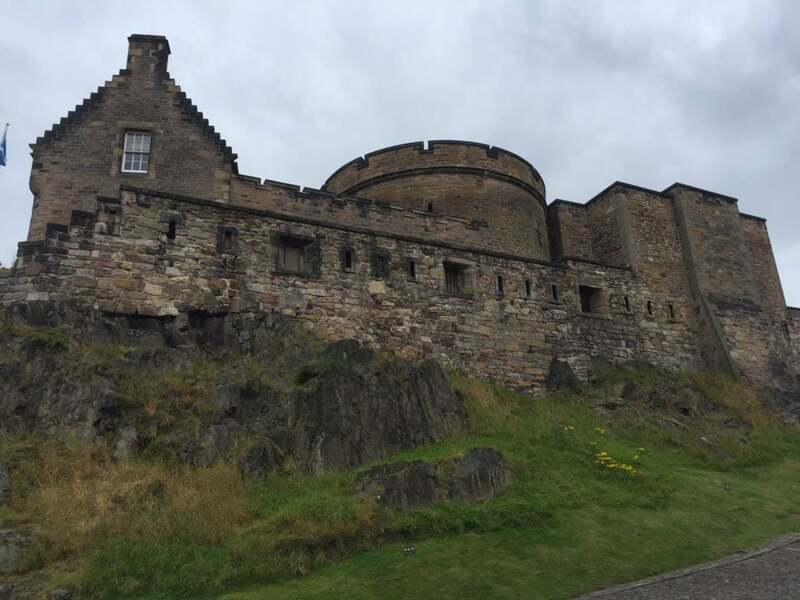 Since there really is a lot to see at the castle, I thought I would highlight my favorites and share some of what I learned about Edinburgh Castle history. Where is Edinburgh Castle located? Once an important resident for Scottish kings and queens, the castle has become Scotland’s most-visited paid tourist attraction. Edinburgh Castle welcomes over a million guests each year including over 70% of Edinburgh tourists. The castle is built on Castle Rock which is 120 meters above sea level. Archaeologists have found evidence of people living on top of castle rock since the Bronze Age, making it one of the longest continually inhabited sites in Scotland. Control of Edinburgh Castle has gone back and forth between the English and Scottish, similar to other Scottish castles like Urquhart. Many believe that Edinburgh Castle is haunted by a bagpiper who went missing in its underground tunnels. There is a dog cemetery at Edinburgh Castle for the honored canine companions of the regimental officers. You cannot enter the cemetery, but you can see from the Upper Ward. Now the castle is home to Scotland’s crown jewels, three military museums, the National War Memorial and more. One of the draws of the castle is the amazing views of the city of Edinburgh. Edinburgh Castle is actually pretty big and has a lot to see. We spent half a day exploring and got to see everything that we wanted to. While we explored the castle on our own, you can opt to get an audio guide available for purchase. 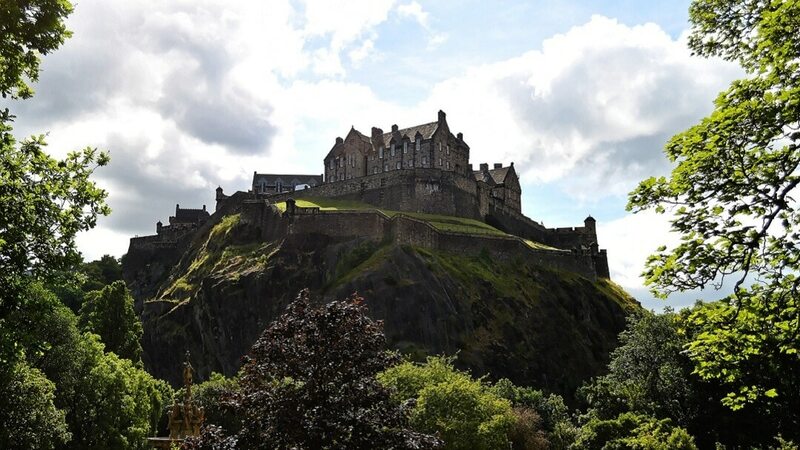 If you prefer to take a guided Edinburgh Castle tour, it is included in the price of admission. Be sure to also take time to admire the view of the city from the castle! 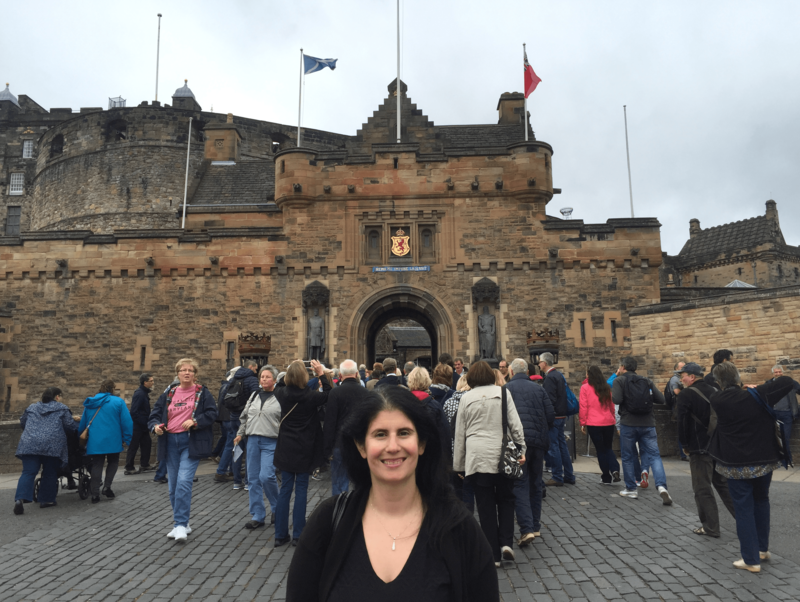 We thoroughly enjoyed our Edinburgh Castle visit and I know you will too. I have been enjoying reading about Mary Queen of Scots (The Other Queen by Philippa Gregory). After reading about Mary Queen of Scots, I think she is misunderstood. I was fascinated by her story and excited to see a place that was so important to her. In the Royal Palace area, you can visit the room where Mary gave birth to her only son, James, who went on to become King James I of England. I also enjoyed seeing the portraits. 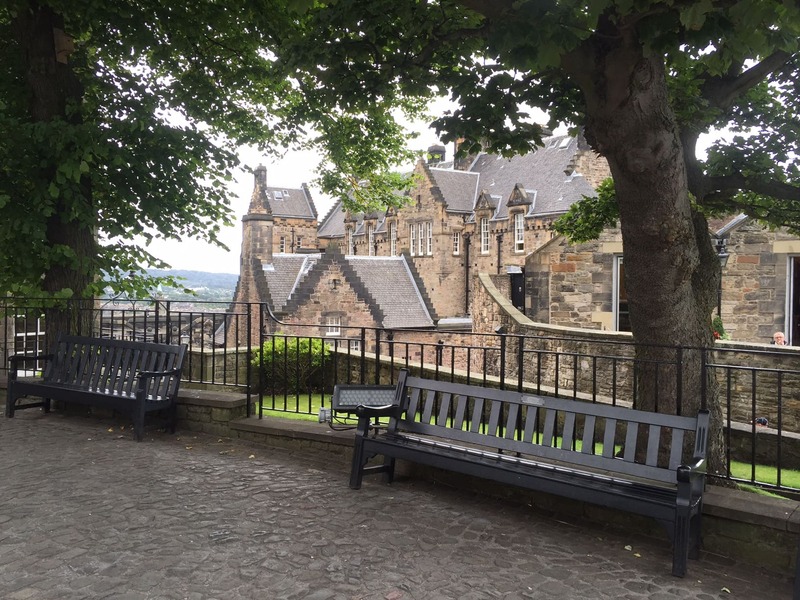 If you are interested in learning more about Mary Queen of Scots, you should also visit her apartments at Holyrood Palace at the other end of the Royal Mile. Also, you should go inside Edinburgh Castle’s Great Hall which was built for James IV of Scotland. Be sure to look up, as the wooden ceiling is impressive. Interestingly, the Great Hall was used as military barracks for a while. Note: If you want to visit all the Royal Attractions in Edinburgh – Edinburgh Castle, Holyrood Palace, and the Royal Yacht Britannia – consider purchasing the Royal Edinburgh Ticket. You can save up to 25% compared to buying tickets for the attractions separately. Click here for more information about the Royal Edinburgh Ticket. Similar to the Tower of London, you can see Scotland’s Crown Jewels inside Edinburgh Castle. I would recommend seeing this first because as time went on, we saw a line develop. The display of the Crown Jewels of Scotland is not as big as the one for England, but it is impressive in its own right. I thought it was interesting that while there was a castle employee on duty in the vault with the Crown Jewels there was no official guard. You can see the crown and scepter first used for the coronation of Mary Queen of Scots in 1543. There are other precious jewels on display as well. It is interesting that at one point during the 17th century they were hidden in David’s Tower (which is like a basement) to keep them safe from the English army. Inside this building you will find the Crown Jewels. Warning get there early, just look at the line. Another amazing artifact that is on display is the Stone of Destiny. For the Scottish people, it is very sacred, but Edward I of England took the stone away in 1296 and had it built into his throne. In 1996, the stone was returned to Scotland and will now only go back to Westminster Abbey for coronations. Mons Meg is a huge cannon at Edinburgh Castle that was cutting edge back in the 1400s. She was capable of blasting a cannonball two miles! Also, not too far from Mons Meg is the 1 o’clock gun. As its name suggests, it is fired each day at 1 pm so that ships can set their clocks. The tradition started back in 1861 and continues today (except for Sundays, Christmas, and Good Friday). Of course, this reminded me of the ball ceremony at the Greenwich Royal Observatory. Unfortunately, due to scheduling, we didn’t see it this trip, but there is always a crowd to watch it. The National War Memorial looks like a church from the outside and it really is a very sacred place. It is a beautiful tribute to the Scottish that died in both World Wars and other military campaigns since 1945. Also, you will find each soldier’s name and they take great pride in keeping the memorial up to date. The Scottish War Memorial is inside a beautiful building. Anisa in the guard hut in front of the Scottish War Memorial. I also enjoyed the Prisons of War exhibition. I had no idea that prisoners of war from the US and other countries like France, Spain, and the Netherlands were held here in Edinburgh Castle. The exhibit gives you insight into what it was like. Additionally, I was really fascinated by the doors where you could see the graffiti carvings of the prisoners. Again this reminded me of the Tower of London. Across the walkway from the Prisons of War exhibition, there is the Military Prison, which Scottish soldiers served time for various levels of crimes and rule violations. Looking up towards the top section of Edinburgh Castle. View from the top of Edinburgh Castle with the city in the distance. While St. Margaret’s Chapel may not be elaborate it is definitely historic. It was built around 1130 by David I for his mother Margaret and is Edinburgh’s oldest surviving building. During the 16th century, it was used for storage and then turned back into a chapel in 1845. The chapel is still used today for christenings and weddings. A traditional afternoon tea would be a great way to end your visit to the castle. In the Tea Rooms in Crown Square at the top of the castle, you can treat yourself to dainty sandwiches, scones with home-made strawberry jam and clotted cream, cake, and whole leaf tea. Honestly, I underestimated the importance of Edinburgh Castle in history. To me, it is kind of like the Tower of London is to England. 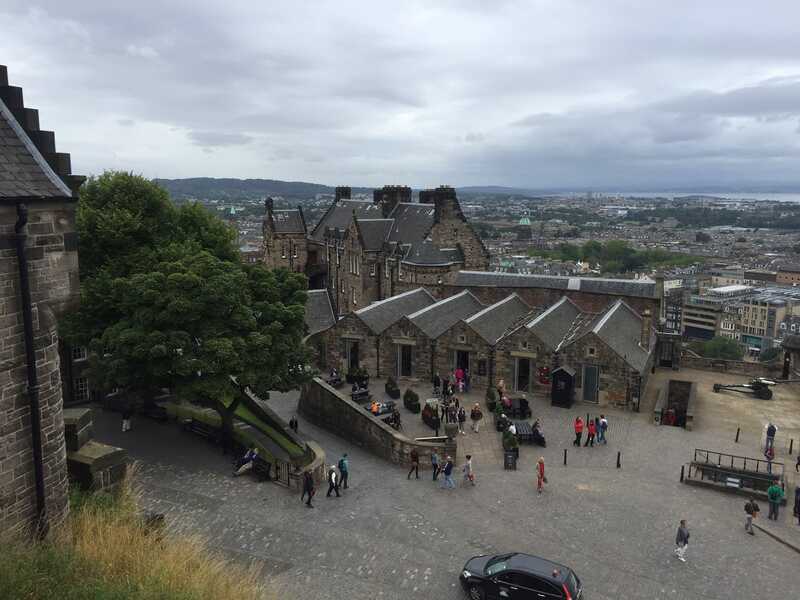 The castle has many different buildings that are worth seeing and the view from Edinburgh Castle may be the best in the city. 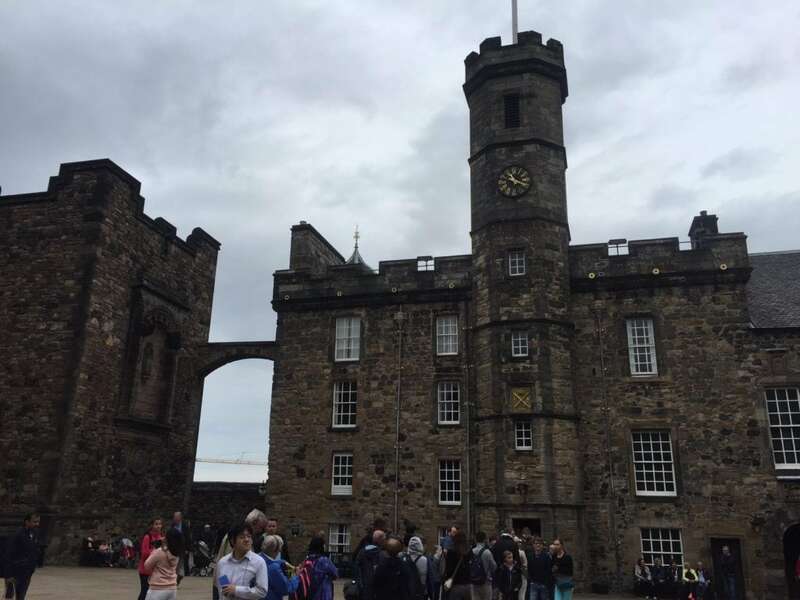 You don’t want to rush through all the things to do in Edinburgh Castle, so I recommend allocating at least three hours to visit. If possible, time your visit so that you don’t miss the gun at 1 pm. A section of the castle with no people! Entrance to Edinburgh Castle is £17 for adults if you purchase your tickets in advance. Edinburgh Castle hours are 9:30 am to 6 pm in the summer. In the winter, the castle closes at 5 pm. The last entry is one hour before closing. Please note that random bag checks are in place at Edinburgh Castle. Suitcases and large backpacks over 30L are not allowed and they do not have storage facilities. This may cause a longer wait to get into the Castle. Fittingly, Edinburgh Castle is located at the end of the Royal Mile on Castlehill. The closest train station is Edinburgh Waverly. It’s about a 10-minute walk. You will be able to see the castle once you exit the station. To get to Edinburgh Castle from Princes Street, go up Waverley Bridge, turn right on Market, then continue onto Mound Place (which turns into Ramsay Lane) to Castlehill. Edinburgh castle is very popular and for good reason. To avoid long lines, I highly recommend buying timed-entry tickets in advance. If you are planning to visit other historic sites in Scotland, consider getting the Historic Scotland Explorer Pass. It includes access to 77 sites during your visit, plus you can skip the queue at Edinburgh Castle. Click here for more information on the Historic Scotland Explorer Pass. I don’t think any visit to Edinburgh is complete without coming to the castle. Have you been to Edinburgh Castle? What do you think are some of the Edinburgh Castle highlights? I would love to hear about your experience. Buy your tickets for Edinburgh Castle online in advance to avoid the line when you arrive. Go see the Scottish crown jewels early before a line develops. 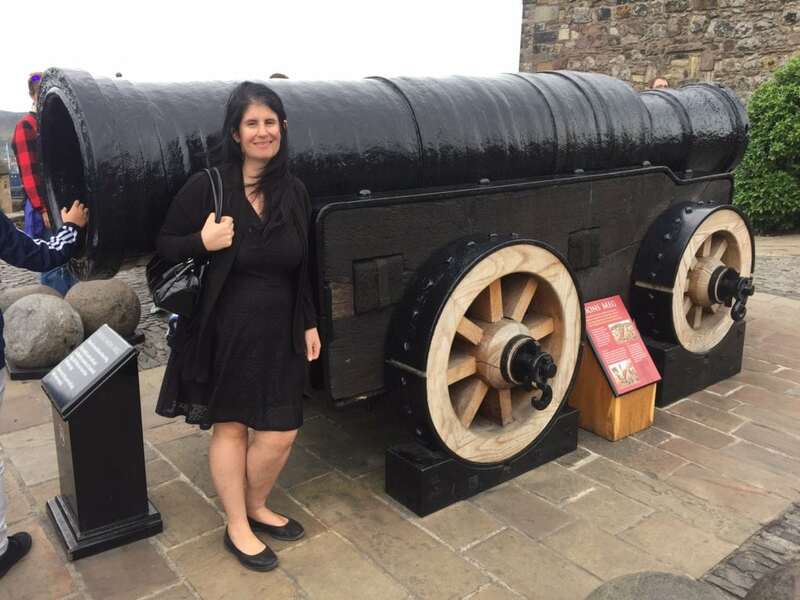 If you are around Edinburgh Castle at 1 pm, don’t miss the cannon. For more tips on planning your time in Scotland, check out our Pinterest board. Disclosure: No financial compensation was received, but we did receive complimentary admission at Edinburgh Castle. As always, opinions are my own. Have you watched the castle documentaries on Netflix and Amazon Prime? There is a good one about Mary Queen of Scots. I always love looking at royal jewels, and any castle is worth a look in my opinion. Looks like another fabulous one! Thanks for the tip Stephanie I will have to check those documentaries out. I love castles too, we saw a few others on the trip, so more castles coming up on the blog. Kate – Thanks so much! The ones on display are original and they have never been stolen. However, over the course of history they have been hidden in other locations several times. I love Edinburgh and Edinburgh castle. Your post brought back my memories of the trip to Scotland. Thanks for sharing. Thanks Anita, it really is a great place to visit. We were in Edinburgh around 8 years ago, and due to budget and time we didn’t go to the castle but saw it from the outside. We’ve been to London so many times and yet again we haven’t visited the Tower of London. However, with what you’ve explained we’ll make sure to pay a visit to both sites next time we visit either place. Thanks!! Sara – It’s impossible to see everything in Edinburgh and London there is just so much. Edinburgh Castle and the Tower of London are both must see places especially for history fans. You won’t be disappointed. How interesting! I never knew American prisoners were kept there. Good tips. Thanks Melinda. Yes, I learned so much on my visit. Rosi – Thanks. Yes I agree and right now I am just obsessed with the history of the royal family. You weren’t kidding…this place has a TON of history! I think it’s on a lot of people’s “must-see” list…but I just like seeing the jewels 🙂 I’m such a girl that way! Jessica – Yes! I love the sparkles too! They just keep the jewels in the open with no guards present? And no one has tried to steal them? I would love to go to Edinburgh one day and I believe you can see a gorgeous view of the city from up here. Thanks for sharing. There were staff members but I wouldn’t call them guards. I don’t think anyone has tried to steal them but there have been times when they were hidden in other locations to prevent them from being stolen. So glad you enjoyed the post Soumya! I want to go to Scotland so bad! I’ve been thinking about it a lot lately. It’s a place that I never was too interested in until recently. It looks so beautiful and I love all of the castles! Thanks for the inspiration! Kristen – You really must go, it is lovely. Lots more coming up on the blog about my trip including more castles and some hiking too. I also started a Scotland board on Pinterest because I want to go back. This is on my bucket list and I’m glad you shared this post so I have some direction when I start planning. Thank you for sharing! Excellent! You will love it. Just be sure to buy your ticket in advance so that you don’t have to wait! Castles are so magical to explore. You did a great job of capturing that in your post. Thanks so much Kristina, glad you liked it. Thanks Melai. It really is a beautiful castle. Add in the views and the history and its a must see! Christine – Thank you. Yes, I learned so much visiting. It is really an impressive place. Wow! Loved this, really learned a lot! Thank you for taking the time to write such an informative post. Thanks Lena. Glad you enjoyed it. Angie – Yes I definitely have that on my list for next time! Oh excellent Upeksha. Which book is your favorite? If only we could have learnt history this way at school. I love finding out about a place that I see in my travels and somewhere like Edinburgh Castle would definitely get my attention. Lynn, yes I had no idea how much history was there before I visited! I learned so much. No, I haven’t been to Edinburgh or its castle. Somehow I’m a traveller who is always attracted to the warmer and sunnier regions in this world. So thanks for making this part of #TheWeeklyPostcard. Thanks Juergen. You should consider going to Scotland in the summer, as the weather was nice when I was there. I don’t like to visit cold places either. Lolo – The book was so good, wasn’t it? Yes I want to see more of the sights too. Awe too bad you missed the crown jewels, but don’t blame you. I hate lines too. Thanks for the tip about Mary King’s Close I will have to check it out on my next trip. Enjoyed reading about your visit to Edinburgh castle. I did visit Edinburgh over a weekend but actually chose not to visit the castle. Thanks Ahila. I hope you enjoyed your time there. Michele – Thanks so much. Glad to hear you loved the castle too! What a gorgeous spot! I’m from New Zealand and currently live in the UAE and neither spots have the amazing history of that part of the world – it’s amazing! Sarah – Thanks and yes its the same thing here in the US. The history in the UK is just amazing. You are right, a visit to a city would not be complete without a visit to its castle. In Europe, I try to visit the castles first. I enjoyed the highlights of your visit to Edinburgh Castle. I haven’t had the opportunity to stop by. but hope I can do it soon. Thanks so much Ruth. I love to visit castles too. I hope you get to visit soon. 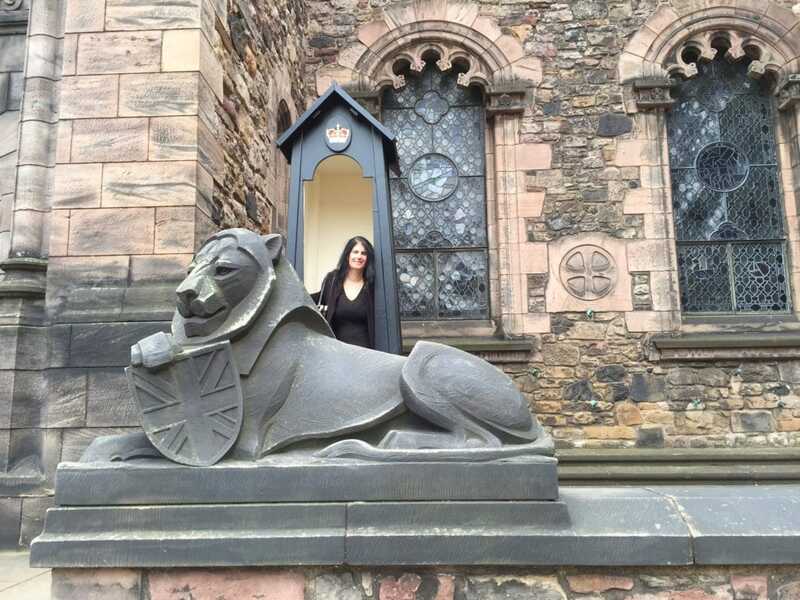 I’ve never been to Scotland and have heard so much about all the folklore and history!!! I am simply stunned that nobody has ever tried to steal those jewels. It’s really cool to hear how diverse the castles are from country to country. The graffiti from the prisoners in the castles must have been haunting to see. Emily – Thanks. You really must visit Scotland. Its such a lovely place and lots of castles! I have heard great things about Edinburg Castle. You’re right, there are a lot of things that remind me of the Tower of London but also of Windsor Castle. We are such a fan of castles and hoping to visit Scotland soon. Mary – Yes Windsor Castle has so much history too. I hope you get to visit Edinburgh Castle someday. Tanja – So glad to hear you enjoyed it too! So much to see. Castles have always been some of my favorite places to explore while traveling…the history and the picturesque views are just perfect! Would love to go to Edinburgh someday. Leah – Thanks. I love castles too, really I am obsessed. If you don’t make it to Edinburgh – there are great castles in and around London (maybe that is easier?). The Tower of London and Windsor Castle are absolute musts. And there are lots more besides those.